Honor the special people and events in your life and provide lasting beautification to our city parks! 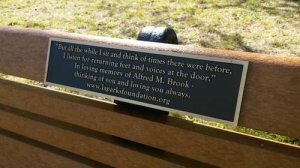 Any individual, family, business or community group can purchase a bench with a personal message on an engraved plaque to be placed in a city park or golf course of the donor’s choice, excluding trails, canyons, bluffs and beaches. Donation Details: Please allow the entire process, from location siting to final installation, to take at least 4 to 6 weeks, depending on your chosen location, which must be approved by the City of LA Recreation and Parks Department. 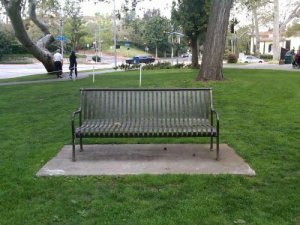 Your donated bench is maintained as LA City park property. 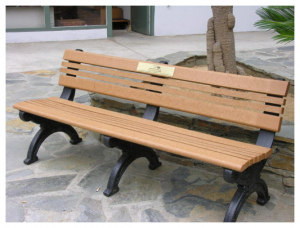 Plaque Details: In recognition of your gift, a plaque with your personalized inscription will be mounted on your bench. The plaque measures 3”x12” and can fit up 4 lines of text and includes our logo at the bottom. A personalized plaque can be placed on an existing bench with a donation of $1,000.00. All donations are tax deductible.